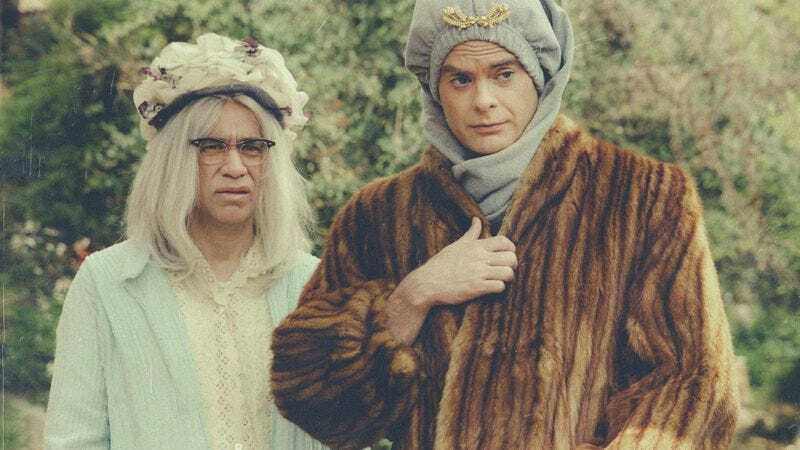 Fred Armisen and Bill Hader in Documentary Now! The new mockumentary series Documentary Now! hasn’t even aired yet but it’s already been renewed—The Hollywood Reporter announced that IFC has preemptively renewed the show for two more seasons, with the third season getting a bonus seventh episode. IFC president Jennifer Caserta said the early renewal was a nod to creators Fred Armisen, Bill Hader, and Seth Meyers’ collective “creative genius,” as well as recognition of the show’s positive advance buzz. The six-episode first season will see parodies of such documentary subjects as Grey Gardens’ Big and Little Edie, as well as as a couple of filmmakers who “vastly underestimate the danger in exposing a drug cartel.” It has all the usual documentary trappings, including Errol Morris-like reenactments and grainy footage of weirdos a la the Maysles Brothers. Dame Helen Mirren will introduce the episodes and lend some British credibility to the proceedings. Hader and Armisen stopped by Late Night With Seth Meyers on Monday so they could all talk about the show, and Meyers reportedly mentioned the two-season renewal at that time. Hader and Armisen also performed as faux-soft rock duo Blue Jean Committee, and you can check out their rather earnest performance below. Documentary Now! premieres August 20 on IFC.